Being discreet with cocaine abuse has not always been a viable social option. What people stick up their nose, they want done right under yours. Flaunting their drug-of-choice has been part of the trip, however with the crack-down on drug consumption, being more subtle has become not only a necessity but an excuse to explore new territories of administration. 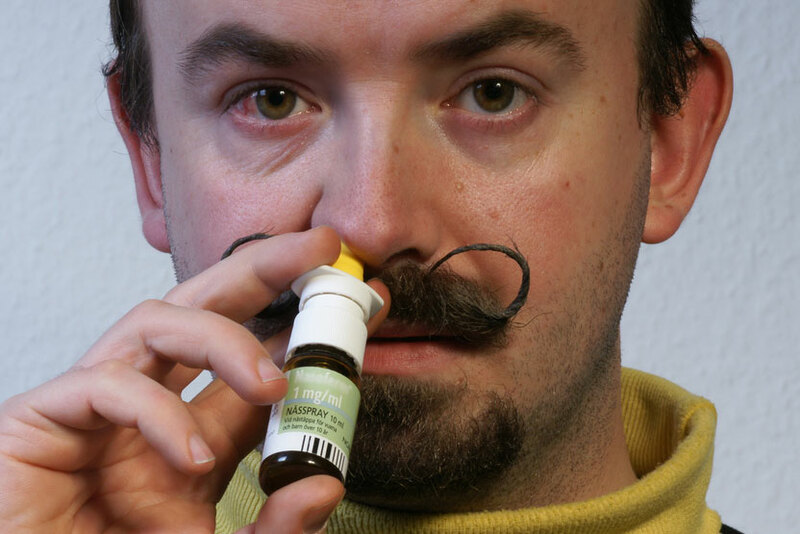 What could be more obvious than over-the-counter nasal sprays? Like a rising chorus of soccer hooligans, cocaine addicts cheer on the benefits of this new technique; reduced nasal tissue damage, no clogged noses, more purity, total discretion. The method is fairly simple: dilute 1/4 gram of coke into 3 parts saline solution, empty contents of nasal spray tube and replace with the amended cocaine solution. Ideally, one would avoid transferring the solid 'cut', found at the bottom of the mixture, into the nasal spray tube. As one anonymous, non-scientific, user states: "A couple sprays in each nostril should get anyone going for some time and the effects are very rapid and powerful due to it being in liquid form". The problem arises when self-proclaimed faux-chemists begin to add other ingredients and suggestions. Some call for the addition of ethanol, medical grade alcohol, or even vodka. Some say tap water is good enough, others distiled water. The recommended proportions are also varying and dangerous. On top of which, nasal sprays are known for their addictive properties. Now users have to face an addiction within an addiction. Case in point, young raver Amanda from Montreal, at 19 years old, was carrying with her between 12 and 40 nasal spray tubes in her purse within 6 months after her first line. At first sharing her discovery, she eventually hoarded her stash, rummaging through her purse dozens of times a night looking for a full tube with which to replenish her trip. She was known to shake her head after each administration, calling out "I'm fabulous and classy!". It became a constant act, until her father, suffering from a cold, found a stray tube in their household. Moments later, the unknowingly drug-fueled parent rampaged through the house and then went out to the shed and onto their riding-mower. He then rode over to the neighbor's lot and removed his 'constricting' pants and shirt, after which he proceeded to mow the neighbor's gravel driveway, strewn with his clothing. This incident brought down the law, destroyed the family's reputation and Amanda ended up in a rehab clinic. Observers of the nasal spray epidemic hope that cocaine users do not discover that drugs are more effective when taken as a suppository.